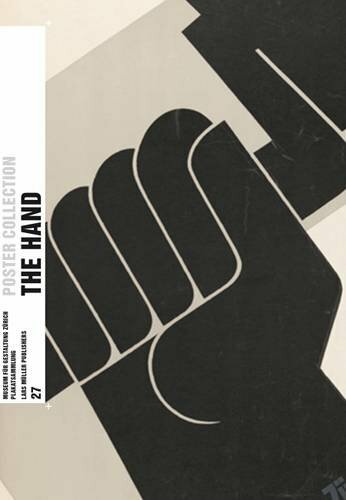 The Hand is the latest poster publication from the Zurich based Mueum fur Gestaltung. With 113 in the book (all in color) they feature this vital part of the human body in all sorts of combinations. Similar themed posters are featured together, for example, writing a message on a hand has five on a spread, an adult holding a babies hand features four on a spread, the hand as a fist has five but oddly Lord Kitchener's famous and much copied 1914 'Britain wants you' army recruitment poster isn't included on the spread with five pointing finger versions. The graphic interpretation of the hand by designers is quite comphensive: hand prints; holding hands; x-ray hands; pensioner hands; claw like hands; hands holding pencils, knives, bottles, phones; cigarettes et cetera. The posters throughout the book are mostly European and date from 1919 to 2010, each has a brief caption with a numerical listing in the back pages giving more technical details. This is the twenty-seventh book in the poster series and nicely they are all the same size and format. Practising designers and students will be stimulated by the creative work in these pages.